Independent workers are now a fundamental part of the U.S. workforce. While the composition of the workforce has changed, policies to help these workers access the set of benefits that traditional workers enjoy has not kept pace. To address this need, the Future of Work Initiative has highlighted the importance of portable benefits for independent workers. In order to support innovative portable benefit concepts that can strengthen the social safety net for independent workers, the Future of Work Initiative is issuing a new recommendation: the creation of a $25 million Benefits Innovation Fund. The Fund will be administered by the Department of Labor and will provide grant funding to help organizations design, implement, and evaluate portable benefit models. 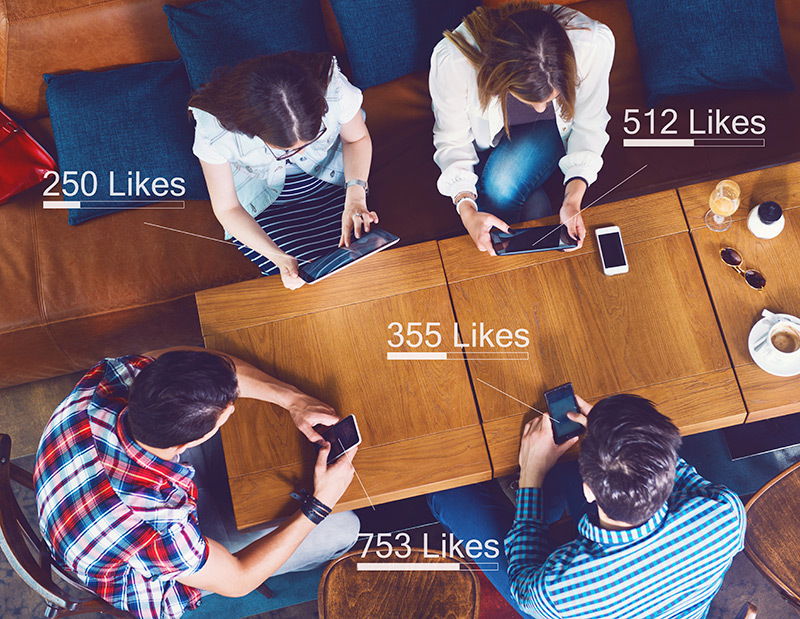 State or local governments and nonprofits would be eligible for the grants, and eligible models must be portable between jobs, accommodate contributions from multiple businesses or on-demand platforms on behalf of an individual workers, and should be scalable to a national level. Since the middle of the last century, America has historically relied on employers to provide workers with health insurance, retirement, short-term disability insurance, and other benefits. When almost all U.S. workers worked for traditional employers, this approach provided a stable safety net. But these traditional employment relationships are becoming less common in the United States. According to economists Lawrence Katz and Alan Krueger, in just the last ten years the percentage of the workforce engaged in alternative work arrangements (such as contracting, temporary work, on-call, freelancing, and gig economy work) rose by almost half, accounting for 94 percent of total job growth over that period. A recent research synthesis by The Rockefeller Foundation and The Bridgespan Group found that at least 36 million workers are engaged in independent work, or roughly a quarter of the U.S. workforce, and could reach between 33 percent and 50 percent of the workforce by 2020. For those who earn some or all of their income this way, it is difficult, expensive, or impossible to access certain benefits and protections such as paid leave, workers’ compensation, unemployment insurance, tax withholding, and tax-advantaged retirement savings. A diverse group of stakeholders – from CEOs to worker advocates – have come together to advocate for a system of “portable” benefits; that is, benefits provided outside of the traditional employment relationship, and which workers can take with them from job to job or project to project. Such a system would improve financial security and empower workers to take more control over their own economic future. Previous work from the Future of Work Initiative has explored existing portable benefit models and various approaches to experimentation. The Portable Benefits Resource Guide is designed to help state and local policymakers forge partnerships with companies, benefits providers, and workers to create innovative portable benefit models. 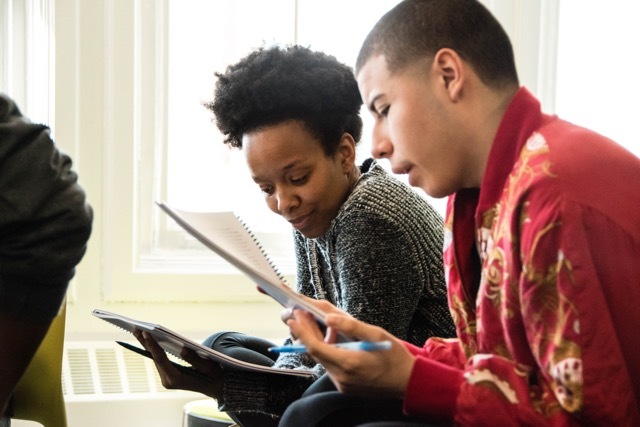 Authored by Future of Work Initiative Fellows Libby Reder, Natalie Foster, and Greg Nelson, the report highlighted five questions that policymakers should ask: what benefits are included; who administers the benefits; who pays for the benefits; is it mandatory; and who is eligible. Portable: The benefits are not tied to any particular job or company; workers own their own benefits, and they can take them from job to job. Pro-rated: Contributions from workers and businesses should be pro-rated by dollars earned, jobs done, or time worked. Universal: Benefits must be able to cover all workers, including independent workers. Policymakers at the state and local level are taking important steps to advance the debate on portable benefits for independent workers. Legislation in Washington State would require labor platforms (Uber, Lyft, Handy, etc.) and other contracting companies to make contributions to a portable benefit fund equal to 25 percent of worker hourly income, up to $6 per hour. The fund would provide workers’ compensation benefits, and could provide additional benefits – such as health coverage, paid leave, and retirement – depending on workers’ preferences. The fund would be nonprofit and partly run by the workers themselves, meaning that this organization could represent worker interests in decisions concerning their benefits. In New York, Gov. Cuomo announced his intention to form a task force to “study creative options and make a recommendation for the State to help ensure all workers in New York, regardless of their industry, trade or skill, have affordable access to benefits.” Roberta Reardon, the state Department of Labor commissioner and Howard Zemsky, President and CEO of Empire State Development, will lead the task force. In addition, legislation may be introduced to establish portable benefits in New York. But experiments are not easy. Setting up a portable benefit fund can entail significant up-front costs, including actuarial studies and legal costs, and compliance with existing regulations. Though the economy is growing, state budgets are still struggling to recover, with nearly two-thirds of states currently facing a budget shortfall or expecting to face one in the upcoming fiscal year. Last fall, the Department of Labor awarded $150,000 in grants to support the research and planning of portable benefit retirement plans. These grants were awarded to three nonprofits – in Massachusetts, Chicago, and Seattle – that work with low-wage and contingent workers. While we believe that state and local governments should serve as the “laboratories of democracy” for portable benefit models, the federal government has a role to play in helping support these efforts to update the social contract. Existing Models: Fund the evaluation of existing models and approaches to providing portable benefits to independent workers ($5 million). 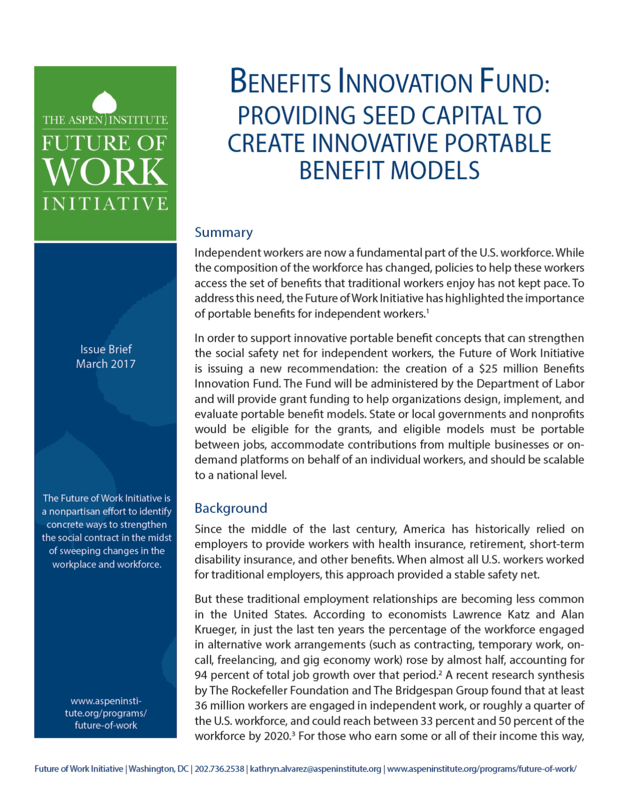 New Models: Fund the design, implementation, evaluation, and seed grants for new models and approaches to providing portable benefits to independent workers ($20 million). The Department of Labor should make grant awards based on whether the portable benefit models (1) are portable across businesses, jobs, or on-demand platforms, and ideally across sectors; (2) accommodate pro-rated contributions from multiple businesses, jobs, or on-demand platforms on behalf of an individual worker; and (3) are potentially scalable to a national level. The program should encourage models that allow workers to have a voice in the administration of the benefits (e.g. a certain share of the board members of the benefit fund could be elected by the beneficiaries themselves). Eligible applicants should include state governments, local governments, and nonprofit organizations. The benefit models should provide benefits to independent workers (including those participating in the on-demand economy), such as independent contractors, contract workers, self-employed individuals, freelancers, free agents, temporary, seasonal, or part-time workers, and other workers who are not traditional full-time employees. Eligible models should provide any number of work-related benefits and protections, such as tax-advantaged pension or retirement benefits; retirement savings; short-term savings; health care; income security; access to credit; insurance or other protection in the event of death, disability, accident (workers compensation), unemployment or job loss; sick (family and medical) leave; training and educational benefits; tax withholding arrangements to fund and pay taxes and other payments; and other benefits and worker protections commonly provided to traditional full-time employees. Benefit providers must have a fiduciary duty to workers receiving the benefits. Experimentation: As we observe in Portable Benefits in the 21st Century, there are a variety of portable benefit models available. The role of the federal government should not be to choose a specific model, but rather to support a variety of approaches. This proposal encourages experimentation, providing future policymakers with real-life examples from which they can learn the strengths and weaknesses of each approach. Innovation: Independent workers may require different types of benefits than traditional workers. For example, unemployment insurance is difficult to apply to independent workers because, legally, they are not employed. On the other hand, they may benefit greatly from services that help them manage income volatility, which is a particular problem for independent workers. This proposal allows for a wide variety of eligible benefits, such as traditional benefits like retirement, health care, and disability, but also allows for innovative new benefits related to short-term savings, access to credit, tax withholding, and training and education benefits. The nature of work is changing rapidly, but our social contract has not kept pace. Innovation and experimentation at the state and local levels is critical to ensuring that all working Americans have the benefits and protections that they need in order to thrive.